AMMAN, Jordan (CNS) — Several Mideast-based Christians working on the Syria crisis have joined a growing chorus about U.S. President Donald Trump’s decision to pull some 2,000 American troops from Syria. They say it puts Christians at risk and could force them to flee again, and they want the decision reversed. They added their voices to other Christian voices in Washington and Europe calling on Trump to reverse his decision, citing concerns for the fate of minorities and the risk they face from Islamic State. “This U.S. decision to withdraw with no guarantees opens up the gates of hell” for the people of northern Syria, said Father Emanuel Youkhana, a priest, or archimandrite, of the Assyrian Church of the East. He spoke to Catholic News Service by phone, pointing to the controversial military threats already made by Turkey to attack the area. Father Youkhana, who runs Christian Aid Program Northern Iraq, a Christian program for displaced Iraqis around the north Iraqi city of Dohuk, is in constant contact with his fellow clerics across the border in northern Syria. On Dec. 19, Trump ordered staff to execute the “full” and “rapid” withdrawal of U.S. military from Syria, declaring that the U.S. has defeated the Islamic State. He campaigned on getting U.S. troops out of Syria. However, a number of top American military officials, members of Congress, the international community — including the French government — as well as Christian activists argue that simply is not true. They also say the U.S. is paving the way for Turkey, Iran and Russia to pursue their interests in Syria. Andrea Avveduto, communications chief for Pro Terra Sancta, agreed. His association, based in Jerusalem and Milan, supports the Franciscan Custody of the Holy Land and provides humanitarian aid throughout Syria, including the north, in Aleppo and Idlib province. Kurdish and Christian fighters, allied with U.S. troops, are largely responsible and credited for eradicating much of the Islamic State presence in Syria. The law commits the U.S. government to provide effective support to Christian and Yazidi victims of Islamic State in Iraq and Syria. Among other things, it holds Islamic State perpetrators accountable and to help the religious minorities rebuild their communities. 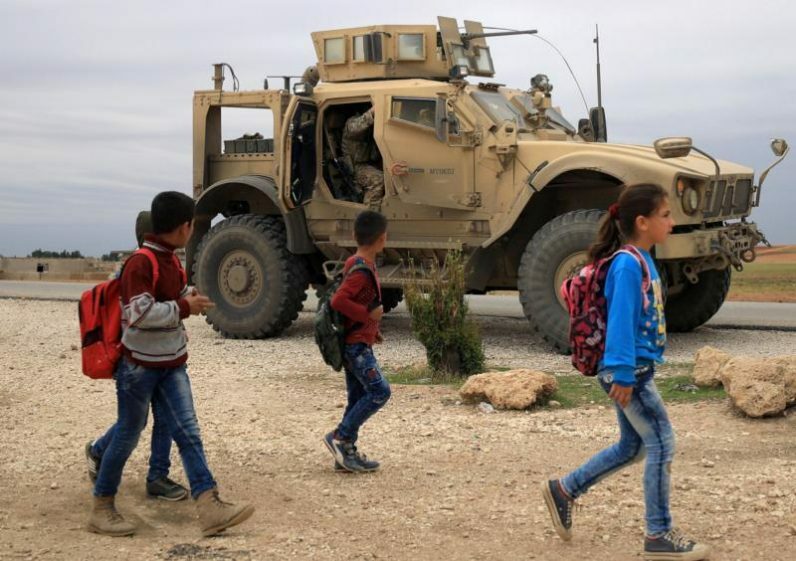 “The decision to withdraw U.S. forces from Syria, however, absolutely contradicts this because such a move will lead to more suffering of these minorities and leaves them feeling there is no future for them,” Father Youkhana said. Northern Syria, particularly northeastern Syria, escaped the violence occurring in other parts of the country. “It’s the least-destroyed or affected area, thank God. They are hosting 1 million internally displaced Syrians. We may disagree on a number of topics with the Kurds and the self-administration, but at the end of the day it is the most stable, intact area,” Father Youkhana said. Syrian Christian political leader Bassam Ishak visited northern Syria in mid-December; he said he was appalled by Trump’s announcement. “This is a catastrophe for the people, especially the minorities,” Ishak told CNS by phone. Ishak heads the Syriac National Council. A graduate of The Catholic University of America, Washington, he is also a member of the political bureau of the Syrian Democratic Council overseeing the self-administration region. For the first time in recent history, the area has enjoyed religious freedom. “Today, the Turkish defense minister vowed that Kurdish fighters will be buried in their trenches. We already witnessed what happened when Turkey invaded Afrin (in northwest Syria earlier in 2018). It wiped out Christian churches there,” he said. Other groups criticizing the withdrawal decision include the Washington, D.C.-based Institute on Religion and Democracy; Sallux, a Christian European political foundation based in the Netherlands; the London-based Jubilee Campaign, which promotes the human rights and religious liberty of ethnic and religious minorities; and the International Rescue Committee, one of the largest providers of health care in northeast Syria. No, I strongly disagree with this reporters take in the situation. Firstly, there are very, very few if any non Assyrian Christians fighting along side the Kurds, the Catholic and Orthodox Syrian Christians fought on the side of the Government. Secondly, the YDF is a Marxist – Socialist group and officially atheist.Thirdly, the atrocities committed by the Turks against the Assyrians and they most definitely took place, but took place over a hundred years ago would not take place now. Lastly the defeat of ISIS was by the Syrian Government troops supported by Lebanese and Iranians,and Russians not the Kurds and US which came in late in the struggle. Sad to see the “Catholic” News Service couldn’t come up with the Vatican’s take on this instead of looking for sources to support some agenda. Perhaps Catholic News Service could have covered Christmas Celebrations which were held throughout Damascus but were they held in Kurd controlled Syria? If you believe this, send your sons to Syria to defend Christians.